Joby Nail Art is an e-commerce business that offers the widest selection of the latest and most fashionable nail art stickers and decals to those such as wholesalers, nail technicians, beauty salons, nail art lovers, and more. Their website is not only a place for shopping, but is also a go-to site for the latest How-To and Beauty tips! No matter what type of website our team at Ready Artwork takes-on, all of us are engaged with a heads-on attitude! 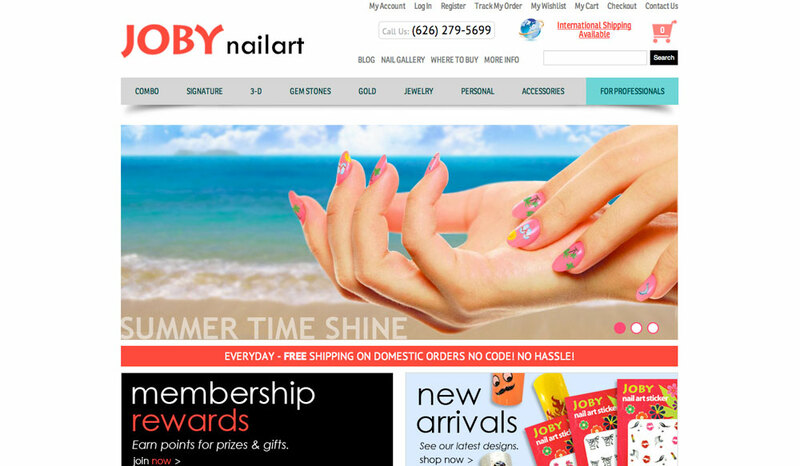 This project with Joby Nail Art gave us the opportunity to redesign their existing e-commerce website. The client has been running their online e-commerce store for a number of years, but with the increase of traffic, brand recognition, and sales revenue, it calls for a more aesthetic sound and functional website. Some of the functions that were essential to the client were the ability to improve the online buying experience, showcase their nail-art designs, present fashion articles along with company happenings, and most importantly integrate their unique tier pricing and shipping policies. Our team closely diagnosed and recognized the needs to handle both the shopping cart and fashion articles; hence, our suggestion was to create the new website with a seamless use of dual platforms of Magento and WordPress. In this case, the Magento system manages all shopping cart and product related elements, while the WordPress system manages all content and image heavy units – like blog, gallery, and content pages. To continue and be consistent with the existing branding of Joby Nail Art, our designers used a mild feminine appearance, which includes the palette of pink, teal and white. With Joby’s special needs to present unique pricing and shipping policies to different types of customers (i.e. salon owners, nail technicians, wholesalers, retailers, regular consumers – all in both domestic and international), our developers custom-programmed a tier group pricing and classification for the backend of the website. With the tier pricing codes integrated, the website administrator can grant access to different online accounts so the consumers can be assigned to different tier groups accordingly. Through intensive testing on the beta website and close communication between the client and Ready Artwork’s project coordinator, we were able to successfully launch with minimal interruption to their online traffic and sales!